Due to a slow start where bank deposits, gas station & lunchtime drive-throughs put me behind, I would only be able to hit two of the four shops I had planned for the second day of the Bead Shop Hop. Ah, but what stops they were! 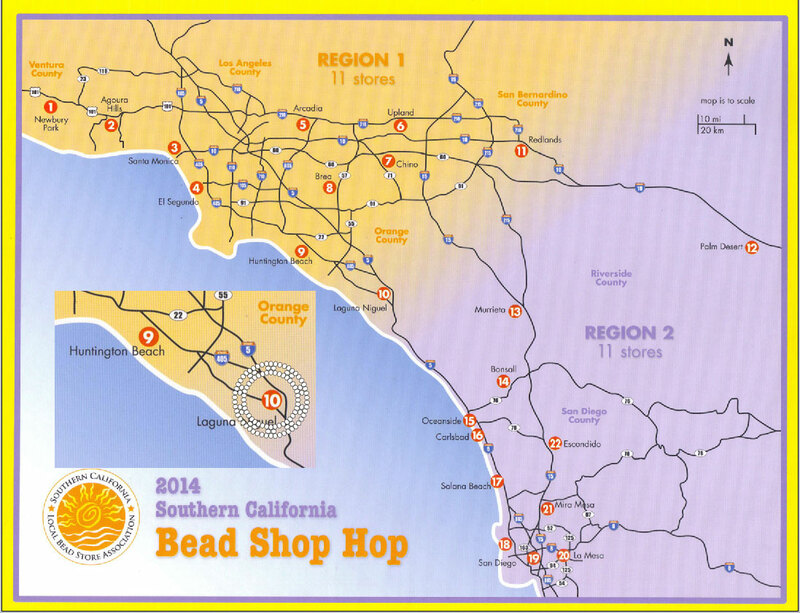 After a quick visit to a New Age faire to see my harp instructor in concert in the South Bay, I travelled South a few more miles to hit Bead Station in Laguna Niguel. Be warned, they are not visible from the freeway, but the instructions on how to get there on the Shop Hop map are very good and will get you going in the right direction. The only trouble I had was how large the industrial-like retail strip was and it took a minute to locate their store front, but once there, I was very glad. Even out of the roasting heat of the San Fernando Valley, the entire Southern California coast has been cooking and in a hot car, the air conditioning can only do so much to mitigate the heat. This was my third stop along The Hop where I was now eligible for the charm bracelet. Now I have a home for my “bugs” and “flowers” – i.e. the bee, hibiscus flower and dragonfly I had collected so far. 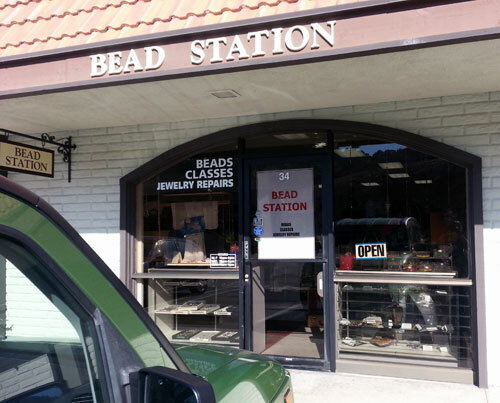 So, what flora and fauna would I collect at Bead Station to add to their company? A beer stein? Hmmm…well, all I can say is those critters will be partying on my wrist tonight! Charm – the aforementioned beer stein. Discounts – a coupon for 50% off one item October 15th – December 31st. Gifts with purchase – Spending as much as I did (not telling!) gets you the gift bag which contained semi-precious stones of a respectable weight, a handmade keychain, water (which I gratefully devoured), cookies and fruit. The food and drink were a nice touch to keep me on the road for the long drive back, thank you. The Haul began with something I first laid my eyes on directly across from the checkout counter. I saw them and must’ve blacked out, because when I came to tally what’d I’d spent so far, I had a veritable rainbow of tubes of GORGEOUS Super Duo-like beads in my basket! (For those that don’t know, Super Duos are oval-shaped beads with two holes punched through a rather flat top and bottom instead of the usual side drilled fashion. They are also slightly raised in between the punches, as if the process of drilling them pushed up the surrounding bead.) Eight of them were breathtaking neon colors, the rest were just as beautiful copper, silver and black. I have wanted to experiment with Super Duos ever since their coming on my radar last year at the Summer Pasadena Bead and Design Show. The colors weren’t all that exciting, though and while I had picked up a couple of tubes then, just wasn’t really inspired to do anything with them and stashed them away for more colors or inspiration to hit the scene. The other thing of note I picked up at the Bead Station were two magazines, one being one I have never seen before called “Creative Beading” out of Australia. They have some AWESOME ideas for beadwork in there. The other was the July 2012 issue of Beadwork, snagged for their “Garden Windows Bracelet” on the cover that utilizes Tila beads – another bead I saw last year, bought two packs and stored away for a rainy day’s creating. 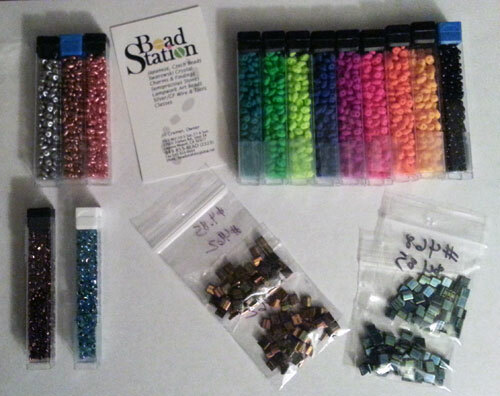 Top – left to right – Metallic super duo beads, neons and black. Bottom – left to right – Size 11 Triangle Seed Beads, “Teardrop” Beads the amazing color of soap bubbles, and Tila Beads in Rust and Green/Purple.